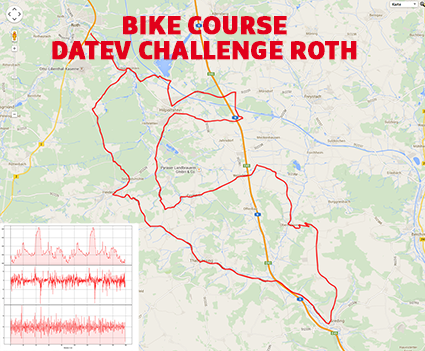 Challenge Roth bike course is a 2 lap course. 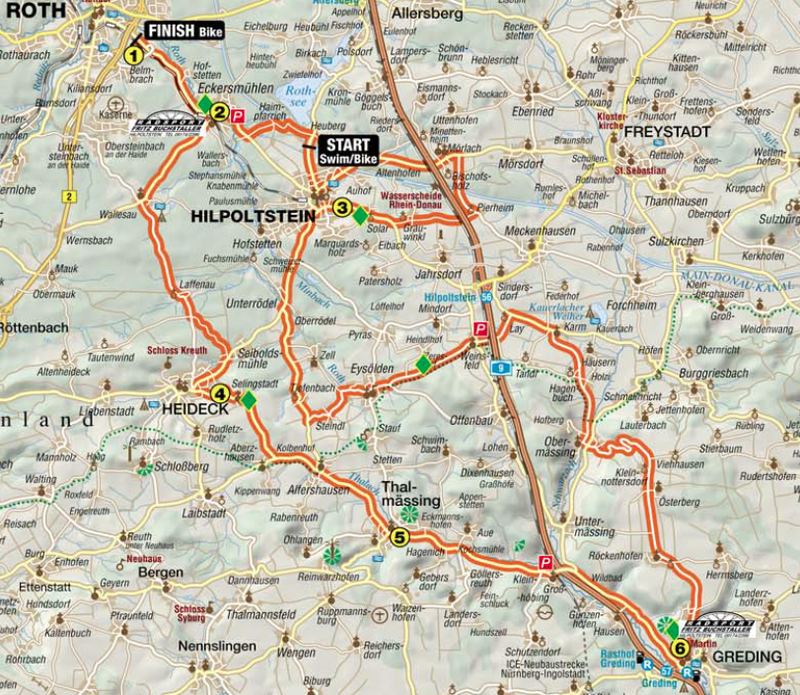 It navigates the riders through the German country side with frequent tours of small towns on route. Some of these communities were like ghost towns without a person to be seen while others were like party central with tables and benches full of beer drinking, cheering people. The topography varied. After leaving the bike start area, the road was always changing; lots of curves and turns through wooded areas and towns. It was very visually stimulating and the constant change made the miles fly by. I made a stop at an aid station at the porta porty. Very infrequently did I see anyone peeing. I am guessing the guys peed off their bikes and the ladies, I'm not sure. Call me a baby but I refuse to pee on my bike. I refuse to have the stink in my shorts and/or the potential damage to my shoes. So I stop. It only took a few minutes and I think the quick change was good. Not long after, I encountered Solar Hill. Solar Hill is an experience to say the least. Nothing can prepare you for the thousands of people lining the sides of the road going up the hill. There is a barricade to start with that is about the width of vehicle but then narrows to the width of a person when the barricades are absent. Here the people are cheering and yelling gehen and schnell, ringing bells, banging things. It is really just like you see in the Tour De France. Beautiful, rolling countryside and more towns followed until the town of Greding. Greding is a breathtaking town. Lots of very traditional style buildings and a town wall surrounding it all built on a large hill. There was a lot of spectators in Greding but were more spread out than in other areas. Greding Hill is amazing. You roll into the town of Greding and immediately start the curvy ascent which seems to go on forever. You look up and see a corner and think "I will be at the top just after the corner" and then you get to the corner and find another steep ascent. I finally just put my head down and kept pedaling figuring when I get to the top will be when I get to the top. It is a decently challenging hill that does continue for a couple miles. 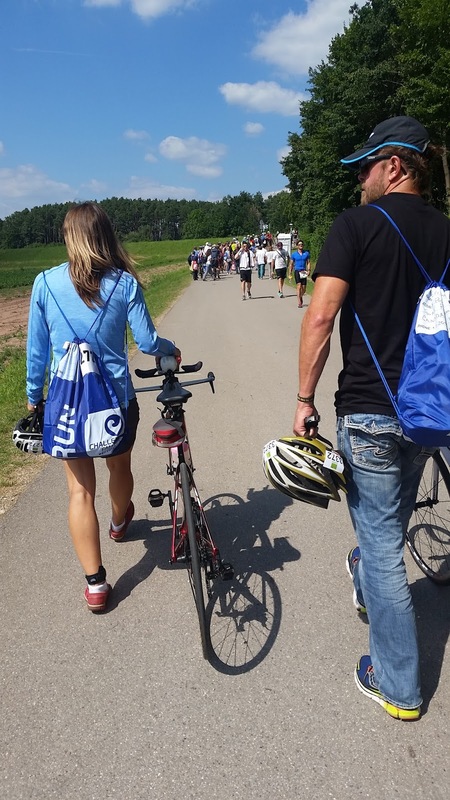 It has been tagged on mapmyride as "challenging, steep and very difficult". 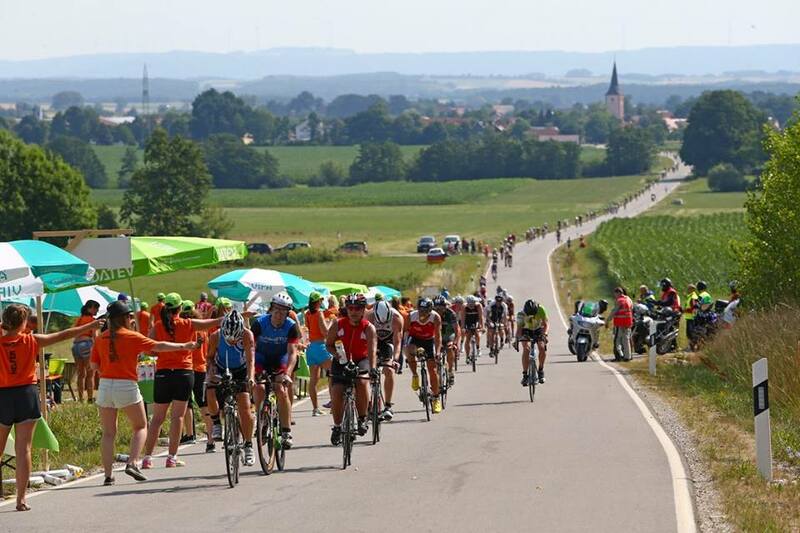 The picture below shows the aid station just beyond the town of Greding. You can see there is still a bit of an incline. This section is very quiet spectator wise but lots to look at with the wide open agricultural land. The next section of the course starts with many very steep descends. I started really rolling down the first hill barely feathering the brakes. People were really flying past me and it is easy to get carried away when you have momentum and peer pressure. But I started to feel an uneasiness in my gut and seconds later a guy that just passed me crashed into a wall of bales at a very sharp corner just a bit ahead. It just seemed to come out of nowhere. The road was meandering so it was easy to be not prepared for a greater than 90 degree corner. He was lying there motionless and a volunteer was already on the phone and assisting him. Put some fear into me. Past the hilly descents through a forest, the course once again opened into large areas of agriculture and flat roads for the most part. 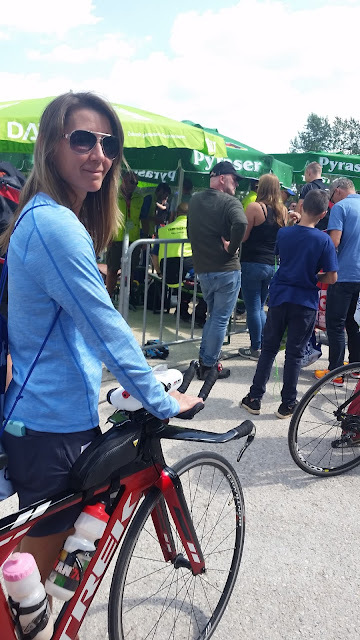 Wasn't too long and I was at the canal at the swim start and beginning my second loop. Second time up Solar Hill had less people and I was draggy a bit. I had stopped on the first lap to use the porta potty and again I stopped to use the bathroom and though I was doing well with consuming my UCAN nutrition and water intake, I hadn't ate any "real" food yet and didn't really feel hungry but I thought I should have one of my pb and j sandwiches. A couple bites in and I was delirious with delight. It tasted so good. How come I didn't think I was hungry when all of a sudden I was ravenous. I ate the whole english muffin w pb and j and a couple bites from the other one. If I was a bit lethargic before the stop, I sure wasn't anymore. Overall, I enjoyed the second loop as much as the first. I think one of the main things that worked for me on the bike was staying in the moment. Through all of my training, I take a distance or route and break it into parts. On almost every other race I have done, I have broken each discipline into smaller, manageable parts. I did NONE of this on this race day. For this ironman distance race, I decided to do this first thing in the morning (it wasn't even really a planned part of my strategy). I just started thinking about how when I start something like the swim, a lot of the time I start thinking about when I will be done. I just didn't want to spend most of my day looking forward to the end of each discipline. Especially on the bike; that is a long time to wait to be done. I wanted to enjoy every moment as much as possible. So I was mindful of a lot of things; my nutrition, my perceived effort, my speed, my time but I was focused on my enjoyment and my surroundings. This made all the difference for me. So much so that I am trying not to say things like "only 3 more miles or only 45 more minutes" like I used to. Making the turn toward Roth to T2 at the end of the second lap was very exciting. I knew what my plan was in T2. 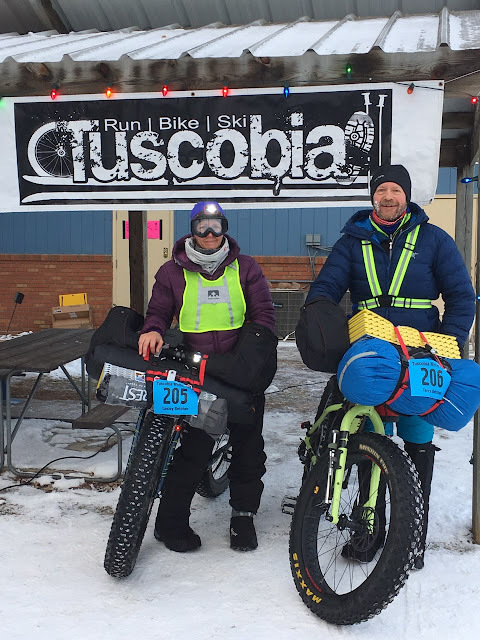 I was surprised that I hadn't been passed on the bike by my husband. His wave started an hour later than mine and I thought that he might have caught up to me close to the end of the bike. I can hear my hoka's calling me. It's exciting to only have 26 miles to go! Going to bike check in.